Our Peterborough depot is at Kings Cliffe, where PC Howard's Head Office and the central hub for all company business operations is based. Our Depot which extends to over 15 acres is the base for a large proportion of our Vehicle and Trailer fleet. The site is adjacent to the A47 with good links to the Motorway network. The site is the base for our Artic and Rigid fleet which provides a Nationwide Delivery and Collection service for Full or part loads, primarily of palletised goods on behalf of a wide range of customers. The site is also the base for our Palletways Operation that services , Peterborough , Huntingdon, St Neots , Corby , Kettering and Wellingborough . We are able to provide a timed delivery service , tail lift service and Handball offload service. The site also offers over 100,000 sq. ft of modern warehousing which includes racked and blocked stacking facilities and dedicated loading bays. We can receive full pallets , de van Containers . Our warehouse team can then provide a range of services which include Carton Picking , reworking , repackaging of your product we can then arrange for the goods to be despatched. 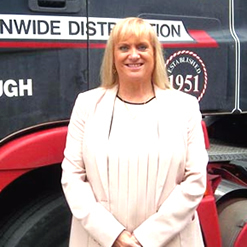 Julie Graziano is your personal contact for all business enquiries relating for our depots at Peterborough, Corby or Northampton. Julie believes in our Ethos of Building Strong Relationships with our customers , and she will look to understand your needs and ensure that we tailor our services to meet those needs . Julie will ensure that your enquiry is dealt with professionally. Call us today on +44 (0)1780 444444 and discover exactly how partnering with PC Howard will improve your supply chain. PC Howard Ltd is an ISO9001 accredited business.